My 12 year old daughter has asked me to crochet her a lap blanket. To date she has shunned every offer of something handmade. Well, that's not quite true. I managed to coerce her into letting me crochet her a cowl last Autumn. I got as far as buying the wool but she ended up pooh-poohing all of my suggestions and then changed her mind. Apparently it's not so cool to adorn yourself with something your Mum has made. I wish I could have crocheted when they were both too little to have an opinion. It must feel amazing to swaddle your baby in a blanket you have lovingly made yourself. Anyway, this turn of events has delighted me, to say the least. It started with her being uncharacteristically complimentary about my Spring Stripe blanket. (My children normally refer to my crochet as "one of Mum's quirks".) When she actually asked me if I'd make one just for her, I nearly fell off my chair. She's drawn a picture of what she'd like (stripes again but that suits me - you know how I adore my stripes) and we've ordered the yarn. There's no going back now. I love crochet. I love the whole process from start to finish. But to actually crochet something specially for my girl which, you never know, could last longer than I do? That is me loving crochet and some. Aw - that's lovely! Appreciation at last, eh?! That's a special moment! Hope you have fun making it, she will love it especially as she has been involved in the designing of it. My (almost 19 yr old ) daughter still would not allow me to crochet her anything :( but she loves my sewing! How lovely, and made even more special by you both being involved either in its design, its making, or both. Have a lovely weekend. My teen daughters have also rejected offers of crocheted blankets etc and there is much eye rolling over my favourite quiet past time, however, I often find them under one of my blankets on the couch! I've decided to make Miss 15 one anyway!!! I understand your excitement! So lovely Heather, I know just how you feel. I keep offering to teach my three girls to crochet but its always a resounding 'No !' That said Meg owns one blanket in her new home, Beth has two in her student home and Immi has put in her order for hers for when she leaves to go to Uni in September. And isn't it funny how whenever you go to get a sofa blanket they are already all being used ! I'm sure your daughter will adore her special blanket , get that hook working quick. Aww that's so sweet, how lovely for you. I made a blanket last year & my son claimed if for his room. They very idea of me making something for him from the start, well that's different. Much eye rolling indeed..
How lovely to hear this! 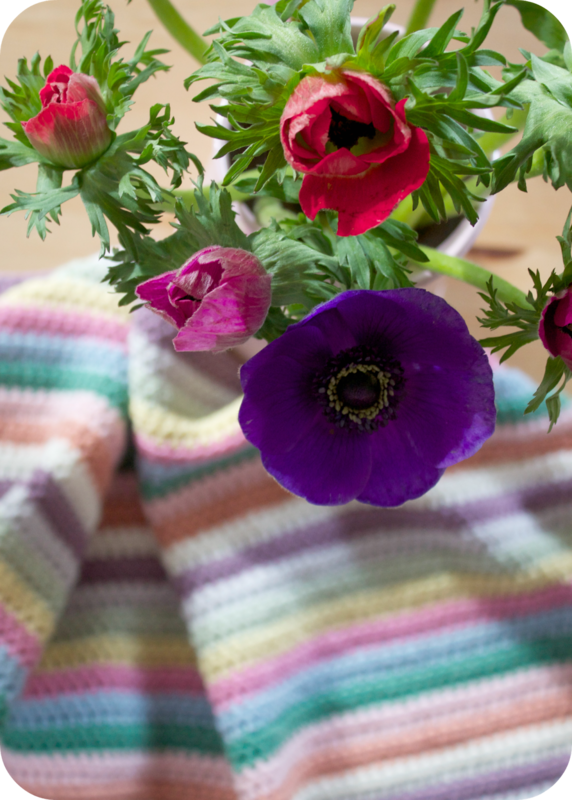 Enjoy making this extra special blanket for your daughter, Heather! Looking forward to seeing it in progress. Hi, I have not long discovered your beautiful blog, but this is the first time I have left a comment. It is wonderful that your daughter wants you to crochet a blanket for her. She will surely treasure it for a long time to come. I am also loving your current stripy blanket project. The colours are beautiful, so springlike. Can you tell me what stitch you are using for it please? Is it dc or htr? I so totally get you here. My lot only ever want something I've knitted if they need a new beanie or workaday mitts. I know it's great that they'll countenance those but it's as though they think I can't be trusted with anything fashionable, and yet hand knitted versions of the machine knits they buy would be so much nicer. Thank you so much for getting replying. HTR's it is then. I shall look forward to starting a blanket. How lovely ..... you'll enjoy this blanket by the sounds of it, it's so wonderful!